Generation FirstStrike is the latest innovation in rodent control, developed with a mixture of milled grain and vegetable oil and the most advanced active ingredient on the market, Difethialone. Generation FirstStrike is the bait of choice whenever you really need your bait to work. 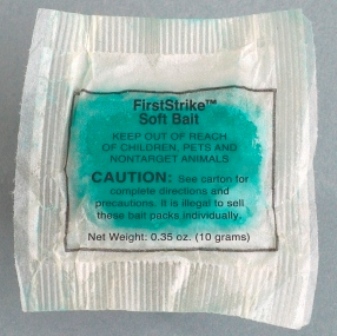 Early in product development, Liphatech understood the need for a rodent bait with increased palatability. The answer – a soft bait. Generation FirstStrike is the latest innovation in rodent control, developed with a mixture of milled grain and vegetable oil and the most advanced active ingredient on the market, Difethialone. Generation FirstStrike quickly outperformed all other baits in head-to-head field testing. Difethialone, one of the three most used anticoagulant discovered by Liphatech, is a single-feed anticoagulant with a rapid mode of action for quick knock down of large rodent infestations. Its wax free soft bait matrix contains high grade food refine cereals and vegetable oils boosts palatability and attractiveness enticing rats and mice to feed on it even when competing food is around. Its 10g securable sachet allows more flexibility in baiting strategy while giving more value for money. Generation FirstStrike is the bait of choice whenever you really need your bait to work. Ideal in clean out situations with reduced treatment time for faster customer satisfaction.